SCCF has been continuously monitoring shorebird nesting activity on the islands of Sanibel and Captiva since 2002. This work is made possible in part by contributions received through our adoption program. The three main species that nest on our beaches are snowy plovers (Charadrius nivosus), Wilson’s plovers (Charadrius wilsonia), and least terns (Sternula antillarum). Shorebird nesting season begins in February and ends in August, when all chicks have fledged. We continue to monitor our birds throughout the year, and also conduct various surveys for other migratory and wintering shorebirds. The cost of adopting one of our nesting shorebird species is $30 (a tax-free contribution). The Sanibel-Captiva Conservation Foundation is a 501(c)(3) not-for-profit organization, and is committed to the conservation of our beach-nesting species. By adopting a shorebird, you will be assisting our project by helping with the costs of supplies. In order to successfully protect our birds, we must set up symbolic fencing around nesting areas, which requires wooden posts, signage, hardware, string, flagging, and various tools. Additionally we conduct various research projects which require a wide variety of gear, including GPS units, trapping and banding equipment, and various other supplies. By banding our snowy plovers with unique color band combinations we are better able to track their nesting success and follow broods until fledging. Lastly, we conduct various educational programs in the field and in our nature center throughout the year. All contributions go directly to supplies for our program, and are greatly appreciated. 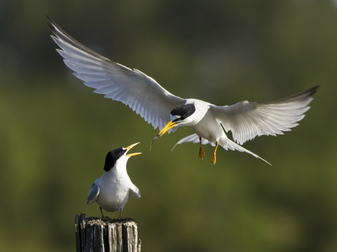 Find out more about SCCF's Shorebird Program here.